Sally Sterling Quinn (born July 1, 1941) is an American author and journalist, who writes about religion for a blog at The Washington Post. 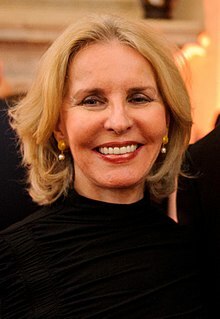 Sally Quinn was born in Savannah, Georgia, to Lt. General William Wilson "Buffalo Bill" Quinn (November 1, 1907 – September 11, 2000) and his wife, Sara Bette Williams (January 27, 1918 – September 26, 2004). Both are buried at Arlington National Cemetery. Quinn has two siblings—Donna of Oakland, California, and William Jr. of Phoenix, Arizona. Her father was an infantry officer who also served as an intelligence officer and played a key role in the transition of the United States' intelligence service from the Office of Strategic Services (OSS) to the Central Intelligence Agency (CIA). As a US Army colonel in World War II, he helped coordinate the invasion of southern France in 1944 and captured Hermann Göring. Though he was not present, his regiment liberated Dachau concentration camp; he arrived the next day, when he heard the news. From 1964 to 1966, he commanded the Seventh Army in Germany. Quinn wrote about his career in an autobiography, Buffalo Bill Remembers. For many years, the Quinns lived on Connecticut Avenue N.W., Washington, D.C., where Bette Quinn was known for her cooking and entertaining. Sally Quinn reported in CC Goldwater's HBO film Mr. Conservative that Senator Barry Goldwater spent much time with the Quinns, often staying at their home, since his wife decided to remain in Arizona rather than D.C. while Congress was in session. Quinn attended and graduated from Smith College in 1963. A Savannah, Georgia, native and Smith College graduate, Quinn began at The Washington Post with very little experience: reportedly called by Ben Bradlee after a report of her pajama party in celebration of the election to Congress of Barry Goldwater, Jr., the job interview included the following exchange. However, Quinn soon demonstrated, as a reporter for the paper's style section, a talent for drawing out the subjects of her interviews and profiles. Henry Kissinger said, "[The Post reporter] Maxine Cheshire makes you want to commit murder. Sally Quinn makes you want to commit suicide." A notable incident of her career was her claim that Zbigniew Brzezinski, then the National Security Advisor, jokingly opened his fly in front of a reporter, a claim The Post retracted the following day. Quinn was critical of President Bill Clinton during the impeachment trial, stating that he had "fouled the nest". Quinn had a long-standing animus for the Clintons, possibly due to a perceived snub by First Lady Hillary Clinton, who declined a party invitation from Quinn. Regarding Whitewater Independent Counsel Ken Starr, she wrote: "Similarly, independent counsel Ken Starr is not seen by many Washington insiders as an out-of-control prudish crusader. Starr is a Washington insider, too. He has lived and worked here for years. He had a reputation as a fair and honest judge. He has many friends in both parties. Their wives are friendly with one another and their children go to the same schools." Harry Jaffe wrote in Salon that Quinn's condemnation of Bill Clinton's adultery rang hollow coming from someone who broke up the marriage of her boss Ben Bradlee before going on to marry Bradlee herself. On February 19, 2010, The Washington Post published "Sally Quinn's The Party: No 'dueling' Bradlee weddings, just scheduling mistake", in print and online. The column alluded to Bradlee family dysfunction, and discussed her son's wedding, which she scheduled on the same day as the wedding of her husband's granddaughter. The column was considered inappropriate and reader backlash was immediate, criticizing Quinn for airing family laundry and Washington Post editors for printing it. By February 24, the Post canceled her column, which had been appearing in the religion section of the print edition. This was Quinn's last column for the printed newspaper. Quinn continued to write for the Post's Onfaith blog at least through 2015. She remains listed as a contributor. In August 1973, Quinn tried her hand at television, joining CBS News reporter Hughes Rudd as co-anchor of the CBS Morning News. Ninety minutes before her television debut on August 6, 1973, Quinn collapsed while trying to fight the flu. Quinn's ad libs during the show's first week tended toward the inappropriate—in one episode, following a report on the children of California migrant farm workers, she quipped that child labor "was how I felt when my mother and father made me clean up my room." Quinn left the CBS Morning News after the February 1, 1974, telecast. She chronicled her short television career in the bestselling book We're Going to Make You a Star. Quinn was the third wife of Ben Bradlee, her former boss at The Washington Post, until his death in 2014. They married on October 20, 1978. In 1979, Quinn and Bradlee purchased Grey Gardens in East Hampton, New York from Edith Bouvier Beale, known as "Little Edie," for $220,000 (equivalent to $759,000 in 2018) under the terms they were not to tear down the house. Little Edie told them "All it needs is a coat of paint!" The couple then spent several years remodeling the home and fully restored it to its former glory. In February 2017 Quinn put Grey Gardens on the market and sold it for $15.5 million on December 20, 2017. Quinn and Bradlee had one child, Quinn Bradlee, born in 1982. Their son was born when Quinn was 41 and Bradlee was 61. In 2009, they appeared with Quinn on the Charlie Rose show on PBS and spoke of Quinn being born with velo-cardio-facial syndrome, also known as 22q11.2 deletion and Shprintzen syndrome (named after Dr. Robert Shprintzen who first identified the disorder in 1978 and who also diagnosed Bradlee). Quinn wrote of her son's learning disabilities and attendance at special schools in a 2006 blog article "What My Son Taught Me About God." In 2017 Quinn published a book entitled Finding Magic in which she described herself as a Christian who also believes in the occult and the power of magic. She recalled her growing up in a family of Scottish origin which practiced voodoo. She recalled her mother putting hexes on two people who later died. She further described performing hex magic herself on three people, two of whom died shortly after. In addition to her newspaper and television journalism, Quinn served as social secretary for Cherif Guellal. She had a cameo role in Born Yesterday, the 1993 remake of the 1950 romantic comedy. Quinn was the subject of six portraits made by American artist Andy Warhol, and was known as a famous hostess in the 1970s and 1980s; most recently commented on in the play The City of Conversation. The Party: A Guide To Adventurous Entertaining. New York: Simon & Schuster, 1997. We're Going To Make You a Star. New York: Simon & Schuster, 1975. Finding Magic: A Spiritual Memoir., HarperOne, 2017. ^ a b "William W. Quinn, 92, General and Former Intelligence Officer". The New York Times. September 12, 2000. pp. B10. Retrieved January 5, 2010. ^ "Television: Sallying Forth". Time. August 20, 1973. Retrieved May 23, 2010. ^ "Something About Sally". Vanity Fair. July 2010. Retrieved August 23, 2014. ^ "Press: Brzezinski's Zipper Was Up". Time. December 31, 1979. Retrieved May 23, 2010. ^ a b Quinn, Sally (November 2, 1998). "In Washington, That Letdown Feeling". The Washington Post. p. E01. Retrieved May 23, 2010. ^ Mallon, Bridget (September 11, 2015). "The Grey Gardens Estate Could Be Yours For $175,000 A Month: The infamous mansion has been fully restored to its pre-Edie glory". Veranda. Retrieved September 12, 2015. ^ Peterson, Oliver (September 3, 2007). "Sally Quinn and Ben Bradlee on Grey Gardens". The Southampton Press. Archived from the original on October 20, 2012. Retrieved July 11, 2015. ^ "What My Son Taught Me About God", The Washington Post, December 7, 2006. ^ Bernstein, Adam (April 13, 2009). "Cherif Guellal dies at 76; Algerian resistance fighter and diplomat". Los Angeles Times. Retrieved April 13, 2009. Booknotes interview with Quinn on The Party: A Guide to Adventurous Entertaining, December 28, 1997. This page was last edited on 20 January 2019, at 09:30 (UTC).